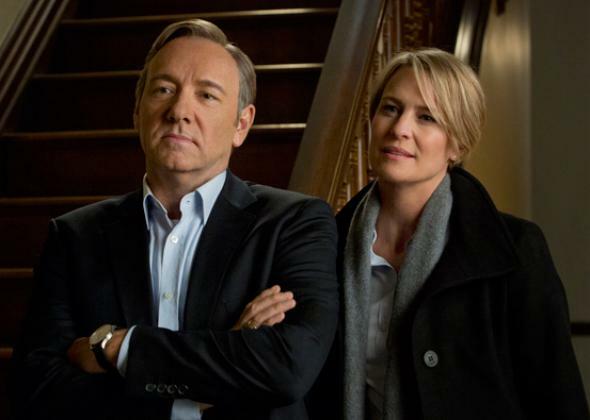 House of Cards Season 2, reviewed: Netflix’s prestige drama embraces its own ridiculousness. House of Cards returns more ridiculous than ever. Thank goodness for that. Kevin Spacey and Robin Wright in House of Cards. The first episode of the second season of House of Cards ends by cursing out its audience. Not metaphorically. Just before the credits begin to roll, the camera closes in on the brand-new pair of spiffy, initialed cuff links owned by Machiavellian politician Frank Underwood (Kevin Spacey) that are neatly propped up in a jewelry box. They read: “F. U.” The initials stay on screen for the entire closing credit sequence. Finally, House of Cards is no longer playing the part of serious-minded, quality TV program and wants to just get naughty. House of Cards premiered nearly a year ago, a flagship series announcing Netflix’s grand ambitions. Directed by David Fincher, starring Kevin Spacey and Robin Wright, and set in an extremely venal version of Washington, the series had its bona fides in order. It was widely binged, became the talk of Washington, and was nominated for just about all the major awards, doing all the credibility-establishing Netflix could have hoped. But there was always a bit of a disconnect between the show House of Cards purported to be—Netflix’s Sopranos, its Mad Men, its gorgeous, morally complex, masterful drama series—and what was actually on screen, something much more melodramatic and ridiculous, a show with a tendentious relationship to reality featuring a leading man who spoke to the camera like Saved by the Bell’s Zack Morris doing an impersonation of one of the Blanches (either Dubois or Devereaux, take your pick). Upon its return, House of Cards feels like it has embraced its crazy, tilting toward Scandal instead of premium cable. In last season’s finale, Frank Underwood was about to be named vice president, and the series picks up exactly where it left off, tying up some loose ends and hurling other plots into motion, laying it all on thick and dripping. Frank remains a man of unquenchable ambition, and he doesn’t have to state his intentions for us to understand where he wants to go: the presidency. “Democracy is so overrated,” Frank says, and proves it again and again, another of TV’s charismatic, evil masterminds who finds manipulating the people around him as easy as cocking an eyebrow. Spacey’s performance feels campier and funnier this time around, and purposefully so, like he’s playing to the balcony at a Steel Magnolias revival. For much of the first episode, he avoids speaking directly to the camera, but when he does, he snaps, “Did you think I’d forgotten you?” his Southern accent large as an antebellum porch and nearly as breezy. Robin Wright, playing Frank’s wife, Claire, is the ice to his fire, but even she gets some humdingers: “I am willing to let your child wither and die inside you if that’s what’s required,” she tells a former colleague, her face placid as ever. The first four episodes fly by in a blur of cheeky maxims, convoluted plot twists, and storylines about the deep Web. Frank has a new political protégé, Jacqueline Sharp (Deadwood’s Molly Parker), a woman Frank recognizes as spiritual kin. When he calls her a “ruthless pragmatist,” she looks turned on. She’s the sort of woman who can say, “I hate myself for [doing this horrible thing], but I’ll get over it,” with so little emotion, she was clearly never under it. On House of Cards, the world is still inhabited by two types: chumps and double-dealing, amoral strivers, the only people who ever get anything worth having. Yet as cynical as House of Cards is about politics and politicians, its own politics bear no resemblance to reality. (Spoiler etiquette with a show like House of Cards is more than a little confounding: By Friday morning, it will all be out there. But I’ll play it safe, and issue a spoiler alert over an extremely dry storyline that makes a hash of that always scintillating subject, congressional bargaining.) In one plotline, Frank tries to broker a deal with Tea Party members to keep them from shutting down the government. He persuades his fellow Democrats to go along with his plan by arguing—incorrectly, as our recent history has demonstrated—that the Democrats alone would be blamed for a shutdown. But to actually get the bill passed, Frank authorizes the arrest of Republican senators refusing to appear at roll call. He’s so worried about optics he won’t permit the Democrats to let the Tea Party shut down the government, but he thinks it’s just fine to have Republican senators dragged into the Capitol in handcuffs on his orders. If this is Frank’s idea of good crisis resolution, he needs to hire Olivia Pope. Yet harping on the outlandish and silly mechanics of House of Cards’ political plots feels like taking it in the wrong spirit. House of Cards really is designed to be binge-watched, by which I mean consumed so quickly there is no time to taste all the garbage we are guzzling down alongside those delicious and sneering putdowns. Apportioned out every week, dissected for plausibility, judged on execution, House of Cards would barely be worth your time. But slammed down in a week or two? You’ll only notice the aftertaste when it’s all done.